Nearly everyone enjoys eating out. What's not to like about a meal you don't have to cook or clean up after you're done eating? But a restaurant meal can easily cost $20 a person, or even more if you drink cocktails or wine with your meal. Competition in the restaurant industry as well as the proliferation of daily deal sites provides an opportunity to enjoy the same meal for less money, giving you the chance to go out more often without taking a huge hit in the wallet. But not all deals are equal, so it is important to be a savvy shopper. A coupon can provide a good discount, but in some instances it may not offer as great a savings as the daily special or the regular value menu. Buying a discount restaurant certificate can provide special savings, but only if you use it before the expiration date and minimum purchase requirements or other restrictions don't keep you from purchasing what could have been a cheaper meal. Drink water -- the free kind. Restaurant beverages, both soft drinks and alcohol, can significantly boost the cost of your meal. A soda can cost $3 at a fast-casual restaurant, adding $12 plus tax and tip for a family of four. A glass of wine may be $10 or $12. %VIRTUAL-article-sponsoredlinks%Plus, these days restaurants often push bottled water, at a much higher price per bottle than you'd pay at Costco (COST). Tap water is a cheaper choice. If you enjoy wine or cocktails, consider having your first drink at home before you go out, or coming home for a nightcap. Take advantage of daily specials. Many restaurants offer $1 taco nights or other specials, especially during the week. Find out when your favorite restaurants offer deals, and pick those nights to eat out. Don't leave home without searching for coupons. Before you go out, you can search for "name of restaurant" plus "coupon" online as well as check the restaurant's website or Facebook (FB) page. You can also find restaurant coupons in the Sunday newspaper coupon inserts, in weekly neighborhood newspapers and in the Entertainment Book. Join restaurant loyalty clubs. Many restaurants will send you coupons for free items or discounts in exchange for your email address. They may offer free meals or desserts for your birthday or send coupons throughout the year. Some restaurants will reward you for downloading or using their mobile app. Look for happy hour food specials. Many restaurant offer special prices on food if you dine early or late. Others offer half-price appetizers along with drink specials. When you arrive, make sure you clarify with the staff whether you need to sit in the bar to take advantage of those deals. Use online deal sites. Two sites that may save you money are restaurant.com and opentable.com. Restaurant.com sells discounted dining certificates: $10 for $25 of dining all the time. But there are lots of sales where you can get those certificates for $4 or $5. The restaurant selection is better in some cities than in others. Plus, each restaurant sets its own rules, so read the fine print before you buy. OpenTable (OPEN) is a reservation site. 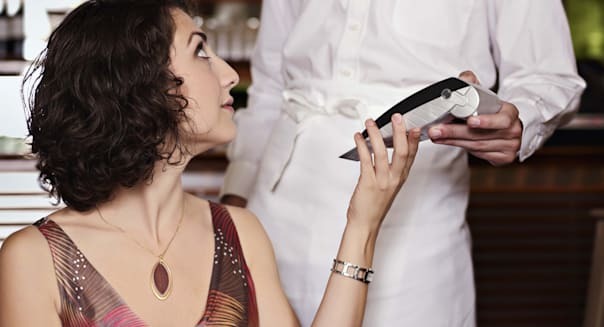 Every time you make a reservation, you receive points. Once you reach a certain number of points, Open Table sends you a certificate good for a discount at any participating restaurant. For example, once you reach 2,000 points, you can get a certificate for $20 off. Yelp.com (YELP), the restaurant review site, also has deals that are worth checking out. Buy daily deals -- judiciously. New restaurants often offer deals through groupon.com, livingsocial.com and similar daily deal services. These come with restrictions, including minimum purchase requirements. Some deals are better than others, so before you buy, make sure the certificate will really save you money. Groupon (GRPN) also has a new service that gives you a discount for reserving through its site, with no voucher involved. Share a meal. Most restaurant meals can easily serve two people, and you can always add an extra salad or side dish, if necessary. If the restaurant doesn't make sharing easy, find one that does. Order appetizers rather than entrees. Appetizer portions are cheaper, more reasonably sized and sometimes more interesting. If an appetizer will fill you up, skip the entree. Your wallet, and possibly health, will benefit. Look for kids-eat-free deals. Lots of restaurants offer nights where kids eat free. Some require adults to purchase a meal or limit it to one free kid's meal for each adult meal ordered. Find senior discounts. Some restaurants offer a special loyalty club for seniors, some have a senior menu and others offer a standard senior discount. If you don't see a senior discount on the menu, ask if there is one. AARP provides a list of restaurants that offer discounts, usually 10 percent off, to its members. Go out for lunch rather than dinner. This is a good way to sample the fare at more expensive restaurants without spending as much money. You probably won't want wine, either.